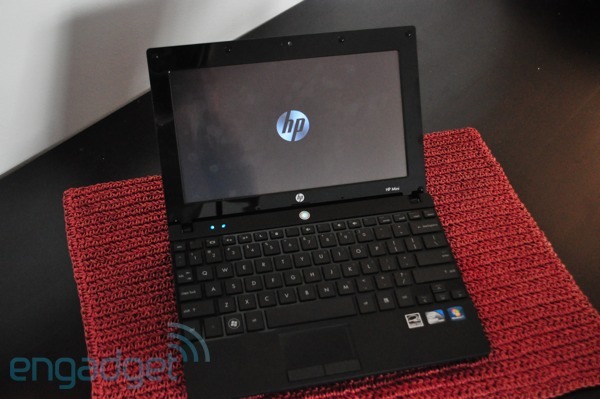 There are netbooks and then there's the HP Mini 5102. Or at least that's always been our impression of the 10-inch business and education targeted laptop, since it isn't every day that you see what's supposed to be a secondary system with a 7,200rpm hard drive, durable aluminum chassis, spill resistant keyboard and capacitive touchscreen options. Or you know, a $415 starting price. The Mini 5102 doesn't fall into the same class as those $299 netbooks -- considering our review unit rings up at $668 and all -- but does the extra dough really pay off in a noticeably better shrunken computing experience? We've been on a mission to find out just that over the last few days, so hit the break for our full review. Be the first to review the Mini 5102? We won't hold back -- the Mini 5102 makes the rest of netbooks we've reviewed look like big sissies (except for maybe the aluminum Nokia Booklet 3G). Identical in aesthetics to the previous Mini 5101, most of the chassis is made of aluminum and magnesium, and not surprisingly, those tough materials make the entire system feel noticeably more rigid than plastic netbooks, like the ASUS Eee PC 1005PE or Dell's Mini 10. We'd still recommend keeping the machine in a case for potential fear of scratching the brushed aluminum lid, but we have no doubt that the system can take a beating in a backpack. In an effort to add some spice to the line and to appeal to those crazy kids we keep hearing about, it's available in red, black and blue, and can be ordered with a handle. The handle, which unfolds from the bottom, adds some bulk and isn't as cute as the OLPC XO's, but we assume the lunchbox-toting kids will just love it! Size-wise, we don't have any major complaints about the .91-inch thick Mini 5102 -- though, keep in mind the touch version is a few millimeter thicker. It's available with a three-cell battery, but our six-cell equipped unit tipped the scales at 3.0-pounds. No surprises with the ports -- 3 USB sockets, a VGA output, Ethernet jack, mic and headphone connectors, and an SD card slot lives along the left and right edges. Hands down, the Mini 5102's spill-proof, chiclet keyboard is one of the best netbook keyboards ever made -- the square matte keys are incredibly firm, and we typed this entire review at an incredibly fast pace with few typos in the original draft. 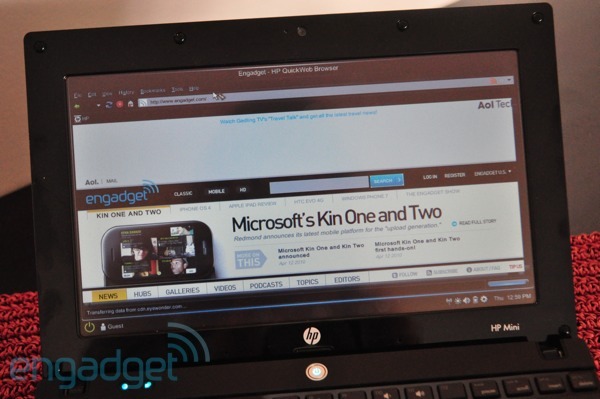 Above the keyboard are two small, circular shortcut buttons: the first launches the default Web browser (Firefox in our case) and the second launched HP's Software Updater. When the system is powered down, the first button will launch HP's QuickWeb instant-on OS and the second its QuickLook -- more on that later. 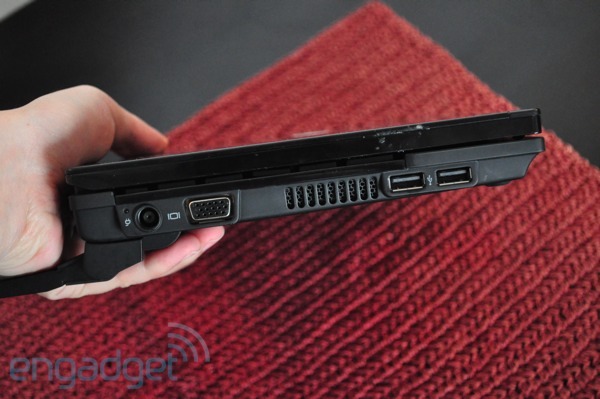 The touchpad is relatively small by netbook standards, though not Fujitsu MH380 small. While we wished the pad itself wasn't covered in a fingerprint-attracting glossy coating, we didn't have any issues pushing the cursor around the screen. However, we're totally tempted to throw a party in celebration of the dedicated right and left mouse buttons rather than the typical single bar. Surprisingly, the pad doesn't support multitouch gestures, but there's a scroll strip for swiftly moving up and down pages. There's certainly no lack of multitouch if you opt to go with the touchscreen configuration. Our review unit came with a 1024 x 600-resolution, 10.1-inch capacitive screen – there's no 1366x768 option if you spring for the touch layer. While the matte screen kicks back little to no reflection, and we much prefer it to the loads of glossy screens we see, the touch layer causes the screen to be fairly washed out. Colors were muted when we watched an episode of Family Guy on Hulu, and even the black text of this review doesn't appear as dark as it should on the 10-inch display. That's the sacrifice you seem to have to make for a rather decent touch experience, however. While our unit ran Windows XP Professional -- rather than the more multitouch friendly Windows 7 -- light taps on shortcuts on the desktop opened applications, and lightly dragging two fingers down the screen allowed for smooth scrolling. Pinching to zoom also worked well in the browser as well as in Picture Viewer. Because it doesn't run a tablet OS, there's no on screen keyboard or handwriting recognition tools. We really don't have any complaints when it comes to the touchscreen's performance or responsiveness, but we'd be lying if we told you we put our fingers to the screen more than a total of ten times in our week of reviewing the netbook. Truth is, we actually completely forgot the touchscreen was there most of the time, and it's not that we don't like the idea of having a touchscreen on a netbook, we just didn't utilize it much with the clamshell form factor. Sure, we know that there are plenty of people that have put touchscreens on top of 10-inch netbook displays, but it just wasn't our thing. We can't tell what you'd do with it, but we're inclined to say if you want a touchscreen netbook you're better off with one of the netvertibles roaming around out there. Like virtually all other netbooks on the market today, the 5102 is powered by Intel's latest 1.6GHz Atom N450 processor. Our unit was configured with 2GB of RAM and a 160GB 7,200rpm hard drive that booted Windows XP Professional, rather than the now standard Windows 7 Starter or Professional. There were no performance curve balls -- the system managed to keep up with us while we simultaneously wrote this review in Corel Write, surfed the Web in Firefox, and IM'd with friends through Digsby. When we first booted the system, we did notice Internet Explorer taking a painfully long time to load sites, but after disabling the three toolbars HP had going on, things seemed to speed up. No surprises on the graphics front – streaming Hulu at full screen was slightly laggy, and attempting to watch any high quality content was a complete bust. 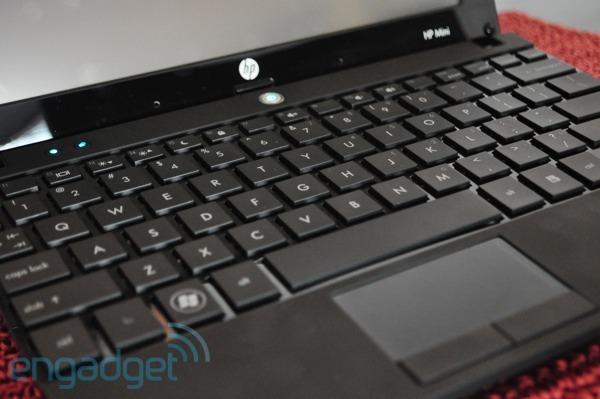 Though, HP does offer the 5102 with Broadcom's Crystal HD accelerator which should push HD content along quite smoothly, much like we saw with the Dell Mini 10 and the HP Mini 210. The Mini 5102 blows past some of the other netbooks we've recently reviewed in battery life – it's 66Wh six-cell battery lasted eight hours and four minutes on our standard definition video rundown test. In our average usage – surfing the web, writing in Word and chatting in Digsby -- we got close to nine and a half hours of life. Yeah, that's an incredible amount of runtime, and the only netbook to outlast it continues to be the ASUS Eee PC 1005PE (though only by a few minutes). No doubt you can leave the charger at home for a long weekend if you don't plan on using it for more than a few hours per day. Usually we mention the software preloaded on a netbook in a sentence or two, but the Mini 5102 is preloaded with so much that we figured it was worth a rundown. In addition to bundling the system with McAfee security programs, Corel's office suite, and Roxio software, HP has pre-loaded a fair share of its own utilities, including its instant-on QuickWeb and QuickLook. It took about 10 seconds for the system to enter the QuickWeb Linux browser mode and while browsing was what you'd expect, oddly the touches on the screen didn't register. The QuickLook software brings up your Outlook e-mail or calender, but doesn't allow for responding or making edits. We've really never understood the point of these pre-boot environments, especially when you can just wait a few more seconds and be in Windows. We don't want to say all of the all of this is crapware -- it's really more deleteware as we have started calling it -- but there's a boatload of preloaded software on this netbook, so be prepared to enter the control panel and do some removing if you prefer your installs to be stripped down. Like we said from the start, the Mini 5102 falls into its own netbook class. We love a lot of things about this business and education aimed laptop, but not enough to spend $668 on the configuration we were given. Heck, at that price we'd pick up an entry-level ProBook that has a similar chassis, but way more powerful processor options. If you can spend a bit more than the average $350 netbook price for a well-built system with an awesome keyboard, then we have no doubt that you should go ahead and shell out $415 on an entry-level 5102 -- though if you want to grab that eight hours of endurance you'll need to spend another $75 on the six-cell battery (we think this is the easiest way to add the six-cell, but navigating HP's business site is like a mine field). But on a final point, the touchscreen and extra RAM that jacked up the price on our unit just seem like overkill for what's supposed to be a secondary laptop.